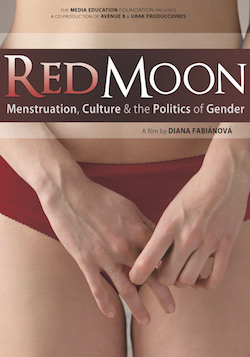 "...Red Moon is an interesting illustration of much of our culture's discourse about menstruation, gender, and identity as a whole..."
"A solid discussion starter for groups focused on women's health or history." "Visually rich and geographically diverse, Red Moon is an ambitious film… blending humor, anthropology, history, psychotherapy, movement, playful animation, and performance art to unpack the paradox of this natural bodily process, simultaneously familiar and mysterious." "...Accessible to a broad audience as it introduces a challenging subject for mass consideration. The reality for artists, activists, researchers and scholars working on this subject is that the taboo and complexity of the subject of the menstrual cycle makes it difficult for work to reach an audience on a broad scale. Through its simplicity, Red Moon has the potential to entertain while it confronts negative menstrual associations with sincerity and lightness. ...[Director] Fabianova has crafted an argument that has potential to move its audience to action ...She wants women to be in control of their bodies through knowledge so that they consume less, flushing fewer tampons and swallowing fewer pills. ...Red Moon will resonate in a classroom setting where students of gender studies, sociology, and anthropology can use the film to facilitate thinking around a previously proscribed subject. ...Beyond the academic classroom, this film should reach a broad audience, though this requires breaking through the fear-induced barrier most programmers have around feminist and menstrual-related films. ...Red Moon has the potential to raise the consciousness of a population of women. It calls upon its audience to engage with some alternatives to mainstream menstrual culture and inspires viewers to produce change in generations to come, thereby reducing menstrual fear, one drop at a time."